I know. I know. Today's Halloween and it's going to be so exciting and everyone loves it. The costumes! The candy! But for me, Halloween just means it's almost the start of the real holiday season -- Christmas!! I couldn't be more excited about getting our first real Christmas tree FROM THE FOREST. And I have really tall ceilings now so I can get a gigantic one!! And I've already started thinking about and even buying some presents. I am totally getting my MIL my friend Ashley's gluten-free donut cookbook! SHHHH. 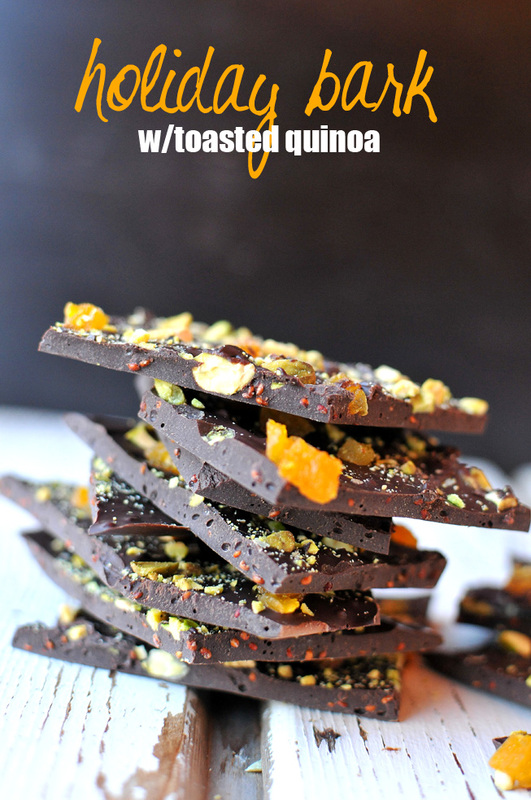 And for my close friends, I'll be making this holiday bark. 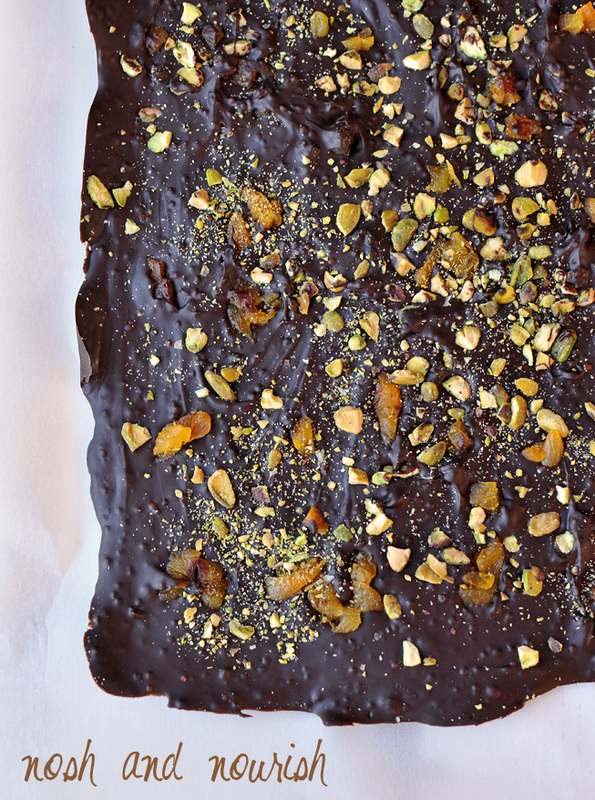 It is like a healthy Nestle Crunch, full of superfoods like quinoa and pistachios. And did I mention it's stunningly beautiful? and delicious. and chocolate. It looks super fancy, but is super easy to make --- Babycakes helped me sprinkle on the pistachios! Are you more excited for Halloween or Christmas? Do you ever make holiday gifts? The Chocolate Chips were made by a brand called "Enjoy Life"
Rinse your quinoa thoroughly until water runs clear. 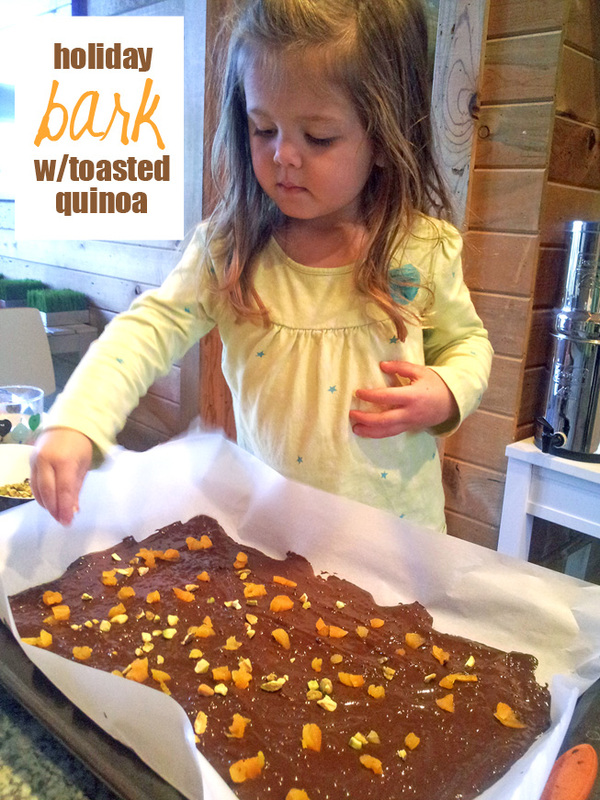 Lay out the quinoa on a baking sheet (lined with parchment paper). Toast them in the oven for 10 minutes. Crush your pistachios (I did this in a ziploc bag). Melt the chocolate chips over a double boiler, or use two stock pots like I did. Put water in the bottom one, the chocolate in the top. Once it is just about all the way melted/smooth, remove from heat and stir in the toasted quinoa. Then, pour the chocolate mixture flat onto a parchment lined cookie sheet. Spread flat with a spoon or spatula. 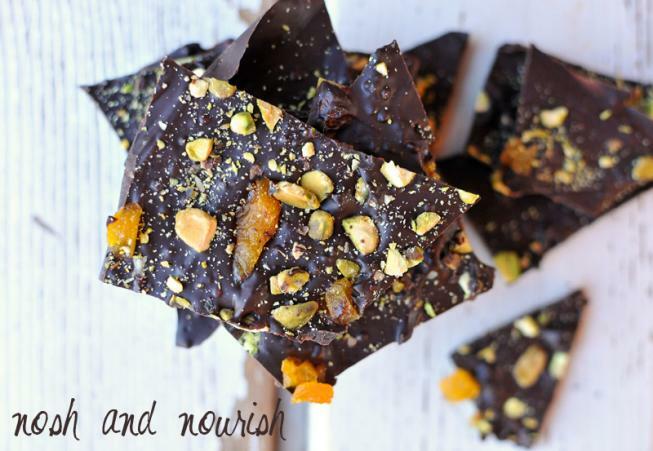 Sprinkle pistachios and apricots evenly onto chocolate. Gently press the toppings into the chocolate. Then break into pieces and enjoy!